A friend recently gave me a lovely book, Cuisine Niçoise, by Hillary Davis, which contains recipes from -- you guessed it -- Nice, including her favorite cookies, navettes d'anise. I resolved to make a batch. There was no photo of these boat-shaped cookies in the book, so I searched the internet and found plenty of photos and many recipes, with surprising variety. While the ones in Cuisine Niçoise use anise seeds, anise extract and vanilla extract, many call for orange flower or rose water, either alone or in combination with anise. 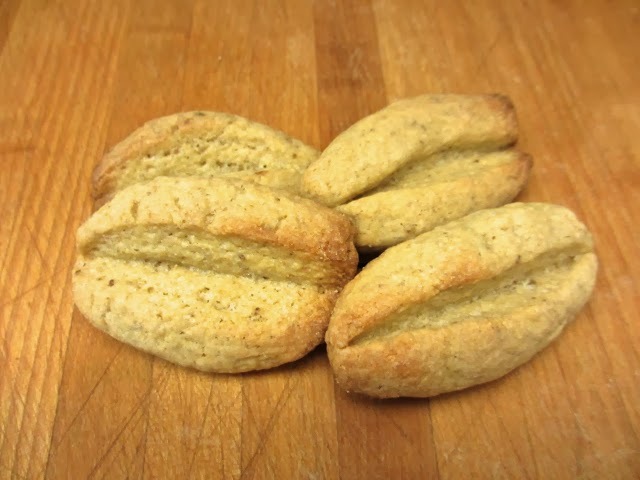 In any event, I followed the recipe in the book and came up with very crispy, strongly anise-flavored biscuits that are good by themselves but even better when dipped in red wine (or vin santo, I imagine).